Two long weeks ago, we were all discussing why this Democratic White House did not use news of mass shootings to press a case for gun control. Eventually, with not much buzz, the president used a speech at the Urban League to come out for something like the Carolyn McCarthy/Frank Lautenberg bill to restrict sales of extended magazines. And then we all got distracted by Chick-fil-A. “This Congress?” In early 2009, Eric Holder confirmed that the White House wanted to bring back the assault weapons ban, or at least parts of it. One month later, the White House was clamping down on any talk like this – this when Democrats had their largest progressive congressional majorities since the 1970s. Strategists worried that making Democrats take new votes on gun laws would be forcing their hands to write suicide notes, which they eventually did anyway with cap-and-trade and Affordable Care Act votes. Just as much, they worried that Democrats wouldn’t even pass the law. 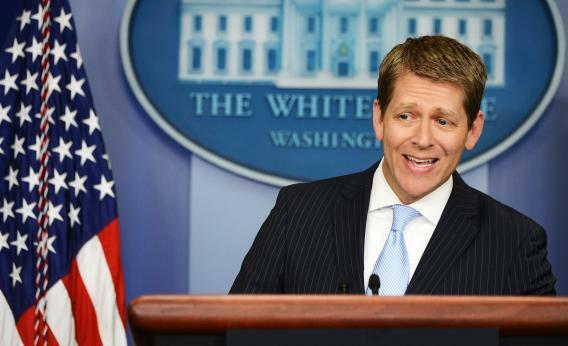 So, Carney’s accurately stated a policy that Obama believes in but has never put muscle behind. The NRA’s coming mailers and ads against Obama can be updated with new quotes. But I think that’s all that happened today.